zenpundit.com » Blog Archive » Will you, won’t you, won’t you join the dance? Will you, won’t you, won’t you join the dance? It is the stunning balletic quality of this image that catches my attention here, and gives this post a title drawn from Lewis Carroll‘s Lobster Quadrille in Alice’s Adventures in Wonderland. 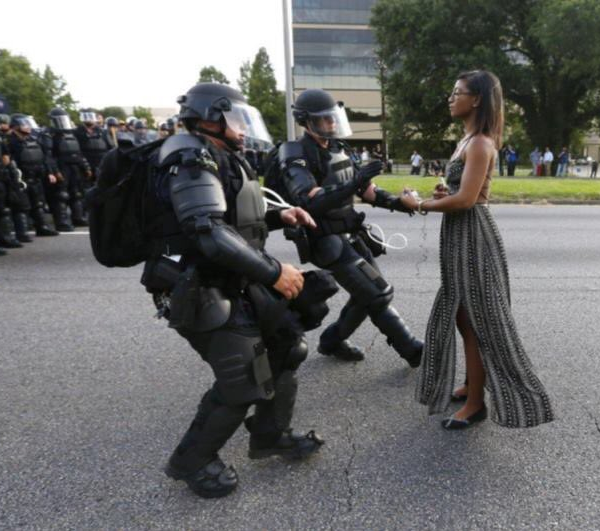 This entry was posted on Sunday, July 10th, 2016 at 8:48 pm	and is filed under aesthetics, beauty, Character, Charles Cameron, law enforcement, media, nonviolence, peace, photography, protest, Uncategorized. You can follow any responses to this entry through the RSS 2.0 feed. Both comments and pings are currently closed. A group of demonstrators had formed a blockade—blocked Airline Highway, which runs in front of Baton Rouge Police headquarters. So law enforcement came out, consisting of several departments within Louisiana … they had come out in riot gear to clear the protestors off to the side of the road. In that attempt, they arrested three to four people as some of the demonstrators confronted the line that the police had created, but for the most part they were able to move everyone off to the side of the road. I had my attention on people confronting the police on the side of the road … I had turned to look over my right shoulder, I think that I had heard this women say something about she was going to be arrested, and I saw this woman, and she was standing in the first lane in that road. It’s representative of the peaceful demonstrations that have been going on down here. I understand that officers have been hurt in other cities, but down here it’s remained peaceful. Thanks for the photographer’s commentary –so often overlooked in the instantaneous sharing through social media. It is a gorgeous and moving shot –no doubt it will go down as one of the iconic shots of the decade. His career will be defined by this shot, just as Nick Ut’s was by the little girl burning from napalm. I love photojournalists. Seeing this one not only makes me stop and admire the restraint of all parties, but also makes me appreciate that Jonathan Bachman was in the right place at the right time. Thanks (once again), Kanani — I strongly agree. I personally don’t see the DoubleQuote in that latter double image, but apparently others do. The dignity, yes.